The prediction software was written in a format that should be both challenging and entertaining. College football is not a game ruled by parity, so we could not have a program that just predicted wins and losses. It would not be too challenging to predict that FSU is going to beat DUKE. We have devised a program that is similar to the way you would bet on college football games in Vegas. The goal of your selection is to predict whether a team will "cover" the spread and to predict the winner of the ballgame. You will receive 2 pts for accurately predicting whether the favored team will win by a certain margin (the spread). You will receive 1 pt for accurately predicting the winner of the game. It sounds complicated but it is simple once you get the hang of it. Practically speaking this means that if you were to bet that Nebraska will "cover" then they would have to beat Kansas by 30 or more points. If you were to bet on Nebraska not to "cover" then either Nebraska has to beat Kansas by less than 30 pts or Kansas has to beat Nebraska. In our prediction program you enter the predicted score of the game. B) Nebraska will cover the 30 pt spread. 1 & 2 are predicting that Colorado State will cover the 3 pt spread and that Colorado State will win the game. 3 & 4 are predicting that Colorado State will not cover the 3 pt spread, however Colorado State will win the game. 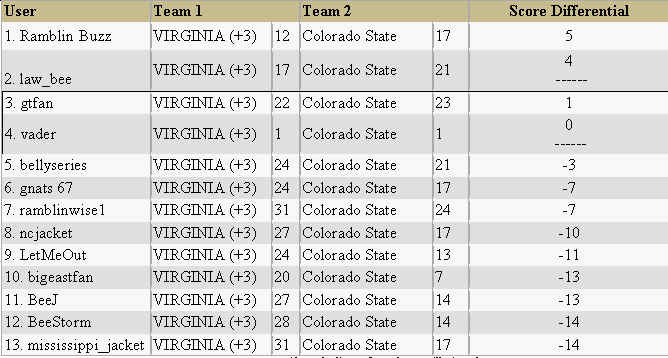 5 thru 13 are predicting that Colorado State will not cover the 3 pt spread and Colorado State will lose the game. The favored team will always be Team 2. If there is no favored team then the HOME team will be Team 2. If you enter a score that mirrors the spread (spread is +3 and you pick the favored team to win by +3) then your score will be deemed to have picked the favored team to cover. Once you have entered the score then it CANNOT be changed so be careful when entering your predicted scores. The charts in the “View Stats” section are just aids to help you see how you are performing from week to week. It does not represent the Official Standings. *The prediction program is for entertainment purposes only. Stingtalk.com in no way endorses or promotes gambling on college athletics.